Unfortunately the internet has spawned a minefield of misinformation and high fidelity has fallen prey to some overly believed myths, so I have written this book covering the basics of crossover theory so that you can benefit from the experience of the engineers over the last fifty years that has somehow gotten lost. At last a book that anyone can understand regarding the design and building of high fidelity loudspeaker crossover networks. 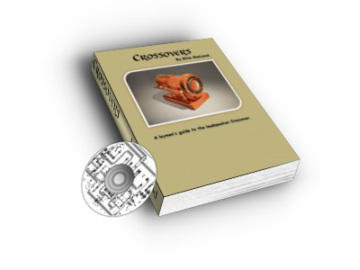 Understand the topologies and what the crossover slope rates are. Learn how they work, how to choose the crossover points, how to test your woofers for the correct parameters, how to calculate the coil inductance as well as a step by step guide on how to wind your own coils. Learn about Butterworth, Linkwitz/Riley and Bessel alignments, about Zobel filters and how they enhance the crossover network. Includes free software and pcb layouts. $5.99 only from this webpage - contact me for details on downloading and paying via PayPal using the 'contact form'.